Are you in need of a portable oxygen concentrator, or simply looking to upgrade from cumbersome oxygen tanks? 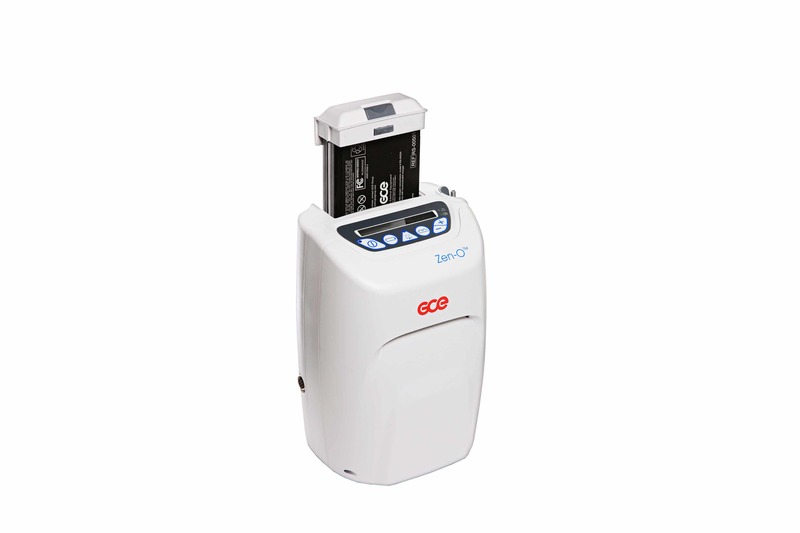 The GCE Zen-O portable oxygen concentrator is a 10 pound alternative to the Respironics SimplyGo. The GCE Zen-O provides you with the ability to run either pulse or continuous flow oxygen settings to fully satisfy your respiratory demands. This brand new state of the art portable oxygen concentrator will provide you best in class oxygen therapy both at home and on the go! 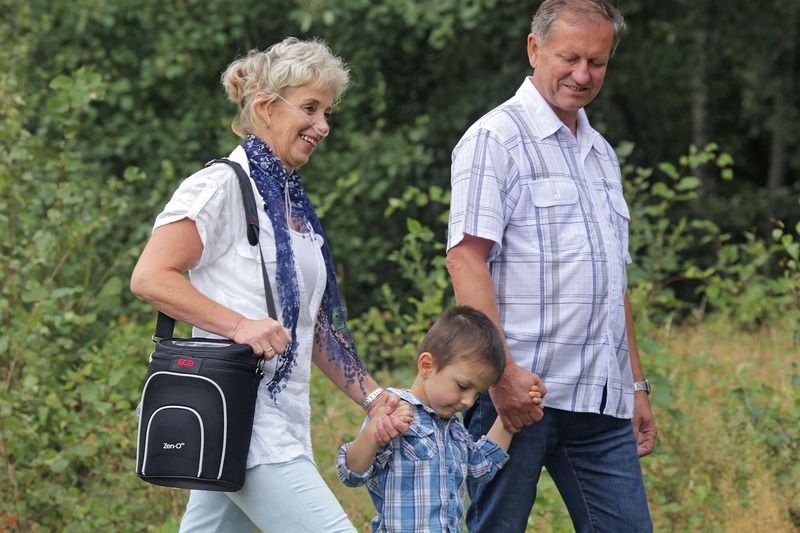 To help you stay on the go for longer periods, the Zen-O oxygen concentrator offers the ability to run 1 or 2 batteries simultaneously without the need for any additional attachments or accessories. The FAA approved GCE Zen-O portable oxygen concentrator is the key to eradicating any mobility barriers that are imposed with the use of heavy oxygen tanks. Weighing in at 10 pounds with one battery, or 11.45 pounds with two batteries, and measuring 8.3″ x 6.6″ x 12.3″, the Zen-O is a compact and easy to transport portable oxygen concentrator. And with FAA approval, you can rest assured knowing that you will be safe to take and use the GCE Zen-O portable oxygen concentrator on-board commercial aircrafts. Not only can you carry the GCE Zen-O around your waist or shoulder, you may also choose to pull it with the included wheeled travel cart. Furthermore, the travel cart gives you the ability to adjust the height of the handle for a customized and comfortable fit. While pulling the Zen-O concentrator around on the travel cart, you will not have to worry about damaging the machine thanks to the included protective carrying bag. When combined with the travel cart, the carry bag will secure the unit to the travel cart and protect the Zen-O from bumps and scratches. All while providing full access to the control panel without removing the bag, thanks to the inclusion of a clear protective screen. 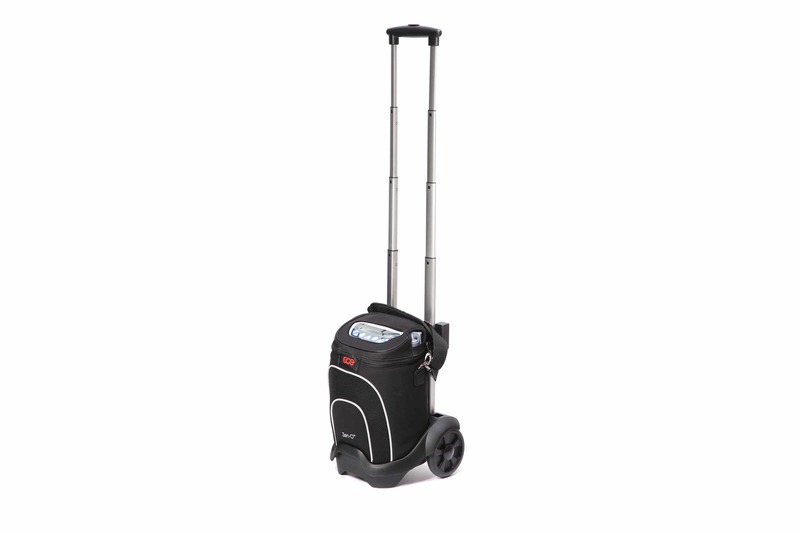 Although you may prefer to pull the GCE Zen-O oxygen concentrator on the travel cart, the carry bag features an adjustable shoulder strap if you would like to carry the Zen-O like a shoulder bag. Whether you require pulse flow, continuous flow, or a combination of both, the GCE Zen-O oxygen concentrator is up for the challenge. Delivering you the best of both worlds, pulse & continuous flow, you can seamlessly switch between flow rates to satisfy your oxygen requirements depending on what you are doing. 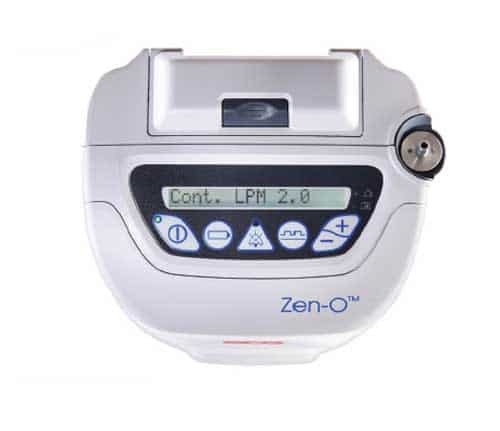 The Zen-O portable oxygen machine offers pulse flow settings of 1-6, with the ability to increase pulse settings in 0.5 increments for a more accurate dosing. On the other hand, if you require a continuous setting, the Zen-O delivers settings of 1-2 LPM that you can also adjust in 0.5 increments. Whether using the Zen-O on pulse or continuous flow settings, you have the option to run 1 or 2 batteries simultaneously. If you are looking for the lightest available package of 10 pounds in exchange for reduced operational time, then you will want to opt for the use of one 12-cell battery. Choosing to run one battery will deliver up to 4 hours on a pulse setting of 2 or up to 45 minutes on a continuous setting of 1.5. However, if you don’t mind an additional 1.45 pounds of weight in order to achieve longer portable operation, running two batteries will be an appealing option for you. By running two 12-cell batteries simultaneously, the Zen-O will deliver up to 8 hours of portable operation on a pulse setting of 2 or up to 2 and a half hours on a continuous setting of 1.5. Options are always good, specifically when it comes to charging! GCE recognized that you may not be near a wall outlet at all times when it comes time to recharge the Zen-O battery(s). Not only can you charge the GCE Zen-O portable oxygen concentrator through a standard wall outlet with the AC power supply. But you can also enjoy charging on the go in your car, truck, SUV, or R.V. with the DC power supply. To really expedite charging and to ensure you always have a fully charged battery ready to go, the optional external battery charger is a must have! To further increase patient satisfaction, you will have complete access to all flow settings while charging the unit, whether that’s with the AC or DC power supply. This means that whether you are on continuous or pulse flow settings, you are able to receive your oxygen therapy while simultaneously charging the Zen-O battery(s)! If you have two or more batteries, wouldn’t it be nice to have an additional battery charging on the side while regularly using your Zen-O portable oxygen concentrator? If you opt for the additional cost Zen-O external battery charger, you can do exactly that! Coming with its own AC power supply, simply plug the external battery charger into a wall outlet and your battery will be charged in a few short hours. Meaning you can leave the house or hotel room, then once you return in a few hours with depleted batteries you will have a fully charged battery ready to go! Let’s face it, electronics are meant to simplify our live’s, however they can often be confusing and frustrating to setup. The GCE Zeno-O medical oxygen machine decided to go a different route. The Zen-O control panel features intuitive button operation that are complimented with an easy to read LCD display. To ensure safe and proper operation at all times, the Zen-O control panel also features audio and visual alarms. In addition, the control panel will also display the flow rate being delivered. As well as the current battery life, helping you to better gauge when it’s time to charge. Unlike other similar portable oxygen concentrators on the market that offer a fixed flow of oxygen. 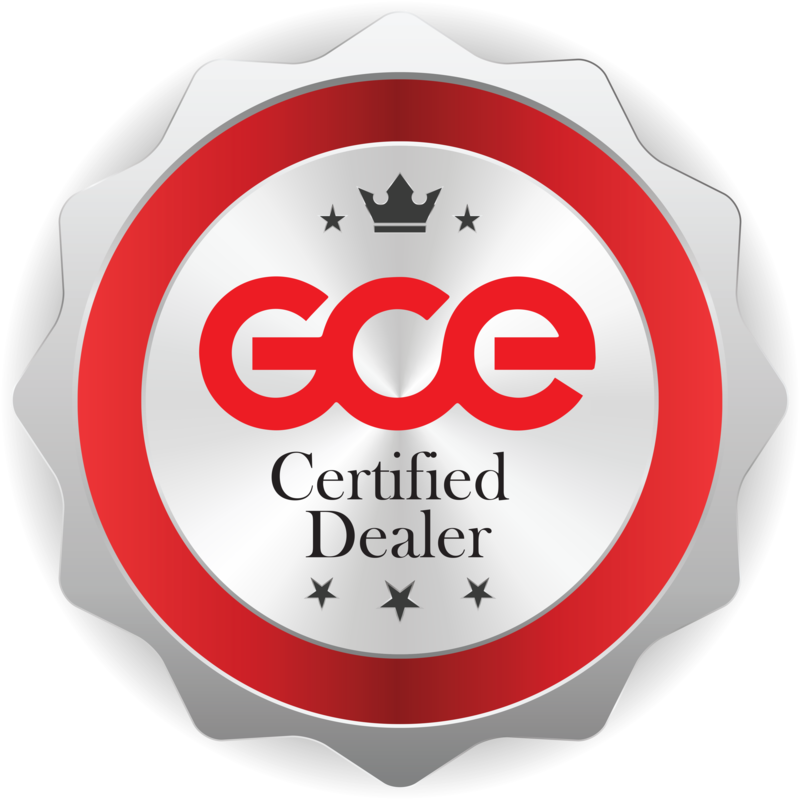 The GCE Zen-O device automatically increases the amount of oxygen delivered, up to 2 liters per minute, if your breath rate suddenly rises. This means that if you suddenly go from sitting to walking up the stairs, the Zen-O will adjust the delivery of medical grade oxygen accordingly to match your oxygen demand by up to 2 liters per minute. 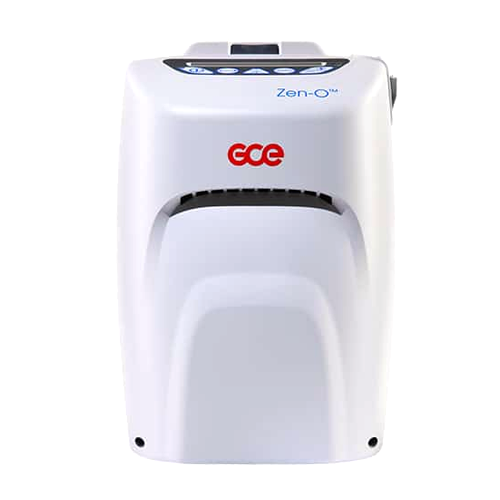 Backed up by a extended 3-5 year warranty or 15,000 hours of total use, you can rest assured knowing that the GCE Zen-O portable oxygen concentrator will continuously satisfy your medical oxygen needs. If you do encounter operational issues that require the unit to be sent in, it helps knowing that repairs will be covered for up to 5 years. The most commonly replaced aspect of an oxygen concentrator are the sieve beds. Most concentrators require you to send the unit into a repair facility in order to replace the sieve beds. Leaving you without your much needed oxygen device for a minimum of a few weeks. This will also help you save a great deal of money over time in repair bills. Zen-O has been designed to allow you or a home care provider to seamlessly replace the sieve beds from the comfort of your own home. Eliminating the need to send the concentrator to the manufacturer. How Much Does the GCE Zen-O Weigh? The Zen-O portable oxygen concentrator weighs 10 pounds with one battery, or 11.45 pounds with two batteries. Is the Zen-O FAA Approved? Does the GCE Zen-O Oxygen Machine Have a Supplemental Battery Option? The GCE Zen-O features two internal battery slots, allowing you to choose between using 1 or 2 batteries simultaneously. Can I Use the AC Power Supply to Charge the GCE Zen-O Internationally? Yes, the included AC power supply is pre-built to be compatible with both US and international power outlets.